Anyway, on with the recipe… This was my first attempt baking with mascarpone cheese and I have to say, I loved it! I had a container in the fridge that was about to expire. Not knowing why I bought it or what to do with it, I decided to throw it into some coffee cake. It was amazing! If you can get your hands on Meyer lemon, it would be even better! It had a nice moist and somewhat dense texture. So delicious with coffee or tea. And who doesn’t like coffee cake? Enjoy your week lovelies! Using a stand or electric mixer (or mix by hand) mix together flour, sugar, lemon zest, baking powder, salt and baking soda; set aside. In a medium bowl whisk together eggs, vanilla extract, butter, lemon juice, mascarpone cheese and milk. Mixture will be creamy. Slowly pour mascarpone cheese mixture into the flour mixture. Continue to mix until just moistened, scraping down the sides of the bowl. Scrape batter into the prepared pan. Using a spatula, distribute the batter evenly around the pan. To make the topping, combine flour, muscovado sugar, butter and salt in a small bowl. Sprinkle evenly over the batter and bake for 40-45 minutes or until toothpick/tester inserted into the center comes out clean. Let the coffee cake cool in the pan on the cooling rack completely before serving. No more excitement, O.K.? Please, just keep using mascarpone for incredible-looking creations like this! Wow, beautifully done. I hope that nasty spider bite is all cleared up! When I saw this recipe pop up in my sidebar I just knew I had to come over for a nibble, Anne. Yummy! I very rarely use mascarpone. I buy it enough but them I just don’t know what to do with it, lol…This recipe is going into my save box. (I also pinned it:) Next time I’m at a loss I know just what to do!!! Bake this Coffee cake because I adore Coffee cake and it must be delicious with mascarpone and lemon. Thanks Louise! I didn’t know spider bites can get that serious. Luckily the discoloration is slowly going away. Thanks for the info. I feel much better knowing this the next time I get bitten (hopefully it’ll be never. :)). Wow! This post is full of drama, from spider bite to luscious mascarpone lemon cake in a few paragraphs! Who said food blogging isn’t action packed? 🙂 Bookmarking this recipe! LOL! Your comment gave me a good laugh, thanks! 🙂 And thanks for taking the time to comment today. Ouch…I seriously don’t want that kind of excitement…but I want those coffee cake bars! They look divine. Gorgeous and super-moist coffee cake, Anne! But, so sorry to hear of your spider bite. I was bit by one once and had a severe allergic reaction to the venom (necrosis). Not fun. Glad to hear you’re feeling much better! Thanks for sharing, girl. Will be pinning during peak time! Spiders scare me to death – sorry for the bite. The cake looks moist and delicious. So sorry about your Spider Bite Troubles….. When we had our farm in Quebec, Canada, I got bitten in the inside of my ear by a spider… it was yucky…. It didn’t swell but is oozed a bit and that scared me, so I went to the doctors. As we now know, spider bites are not to be taken lightly! And – I think I’m in love with this recipe. I haven’t eaten breakfast yet and I want a piece of this sooo bad !! Sorry to hear about your spider bite! Glad you are okay though. First, I’m glad you are on the mend from your spider bite. Ouch! That sounds very unpleasant. I’ve noticed quite a few outside, which makes me think it’s spider season here in the south. Yuck. Onto the cake: I adore Meyer lemons. They are lovely and sweet. Mascarpone cheese is a favorite of mine and showed up in quite a few desserts in our Italian household when I was a child. Using it in your coffee cake sounds like a wonderful idea! Thank you so much for the inspiration today, Anne. 😦 That should be enough excitement to last you a whole month, maybe more, don’t you think?! Those sneaky spiders! Not a fan at all! Oh my gosh, you just made my spider phobia increase tenfold! I wonder when it bit you?? 😦 Glad you’re doing better though. 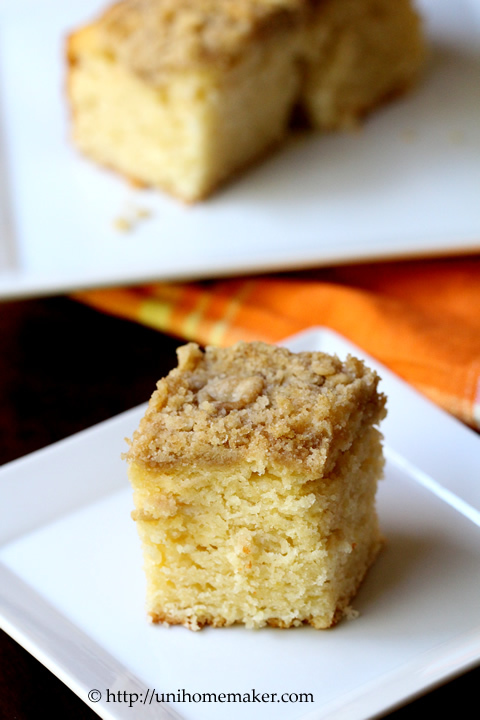 I love that you made your coffee cake lemon-flavored! The texture looks amazing, as do the crumbs on top. So yummy!! Eek – I am terrified of being bitten by a spider! There are a lot more now where we live and I hateeee them. haha. I’m glad you’re feeling better! This coffee cake sounds delicious – I love that it uses mascarpone. I love the combination of lemon and marscapone. 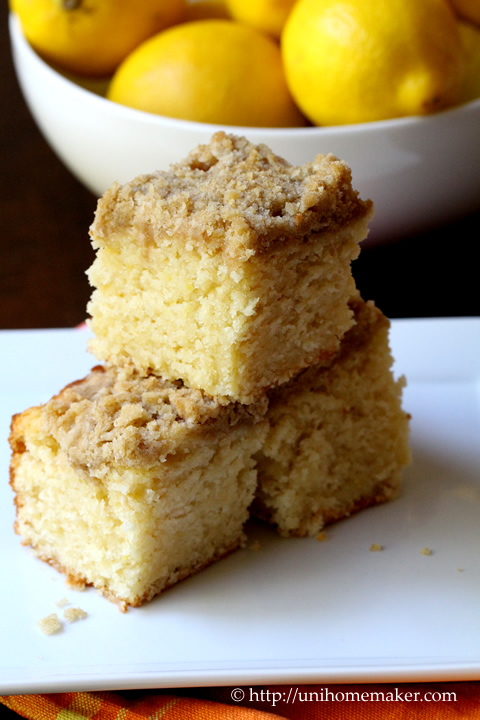 I once made lemon and marscapone gnocchi- but this coffee cake sounds delicious! Sorry to hear about the spider bite! Ouch, I bet that hurt! Mascarpone sounds perfect for coffee cake . . . and lemon too! Yum! I’m sorry to hear about your spider bite…I despise any kind of bite. Especially with the swelling and/or itching. Totally miserable. Did it almost seem to bruise? My youngest had a spider bite last year, and it left a huge bruise and a scar. I love reading about what your week and what you guys do on the weekends! Hi Gloria! I despise any kind of bites too only because I’m prone to insect bites. My spider bite did appear to look bruise-like but went away with a very slight discoloration. It’s my first spider bite and it was nasty! 😦 I can’t believe your son was left with a scar –ouch! Poor thing… I can’t imagine having these bites as a child. Thanks for stopping by today and for pinning! 🙂 HUGS! Oh yummy! Yet another delicious cake to add to my to-do list! This looks fabulous and love that you added lemon, my favourite! Looks so fluffy and moist – that crumb topping gets me every time! Sorry about your bite! That sounds wicked – I’m glad you’re feeling better. I hate spiders! But I love the idea of mascarpone in a coffee cake! Especially combined with lemon. Totally delicious! Oh my gosh – this looks like one bite of deliciousness! I must have me a few! 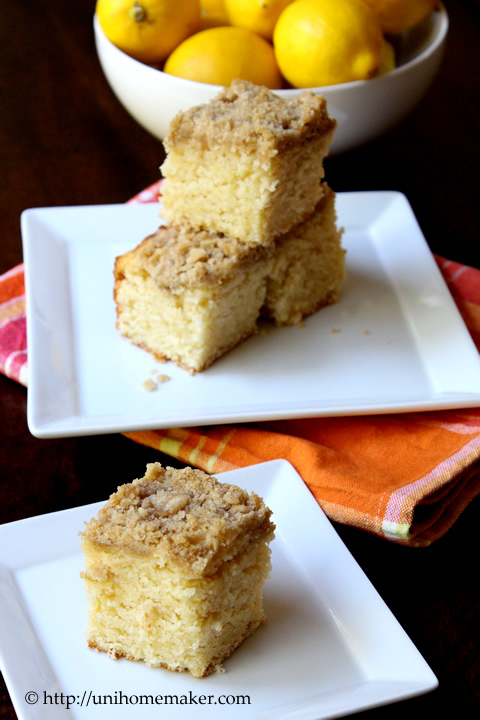 Coffee cake is my weakness, I just can’t get enough Yum to this! I got bit by a spider a few years ago and ended up in the ER when it turned into a tennis ball size on my leg! Hope you’re feeling better! First, I HATE spiders…sorry for the bite! 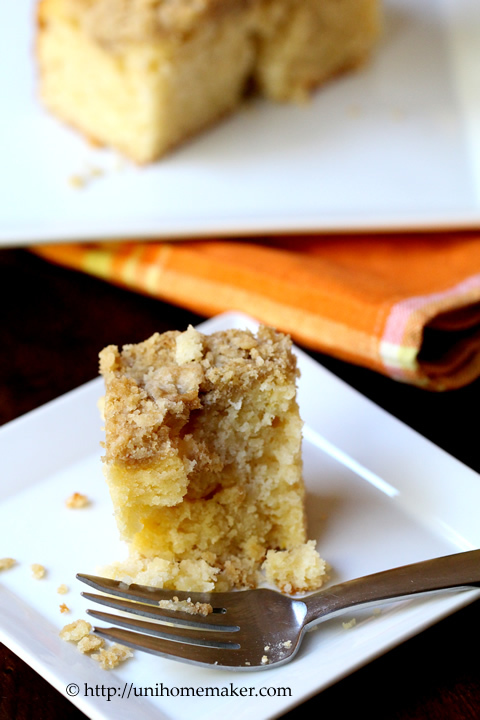 Second I LOVE this coffee cake – lemon is one of my favorites! Pinned to my I heart Lemon board! Oh my goodness it’s 10:36 at night and I want to call room service and ask for these!! Seriously how did you know? These are my favorite ingredients, it’s not always easy to mix them together. The cake looks so soft and moist! This cake looks so moist and very yummy! I love lemon baked goods. Sorry to hear about your spider bite! The.Boy’s mom just got bit by a spider also and it is NOT pretty. I hope yours goes away completely soon!! Mmm mascarpone and lemon baked goods are sheer perfection! I’ve done them in blondies before, but I think this coffee cake MUST be next! That looks like the perfect coffee cake to me, Anne! Love the combination of Lemon and Mascarpone, it makes the cake deliciously moist and fluffy,mmh. The cake looks delicious, like the texture of the crumb…lemon and mascarpone sounds awesome. Yikes…no fun! On a happier note, your coffee cake looks wonderful!!! The combo of lemon and mascarpone must taste amazing! I’ve never used mascarpone in cake before. Or ricotta. Must try! I hate spiders! They can really sneak up on you and sometimes you don’t even realize you’ve been bit until later. At least with bees you usually see and hear them coming. Isn’t mascarpone one of the best things ever! I’ve never baked with it though. Used it in an asparagus gratin once and it was amazing! Your coffee cake looks seriously delicious. Must give it a try. Oh my goodness my mom, hubby, and myself all have been bitten by spiders and had bad reactions (at different time). Not fun! I hope you’re feeling better. 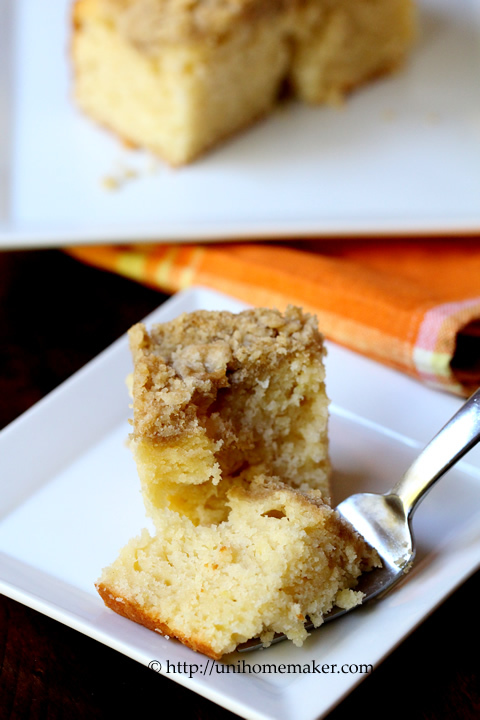 Coffee cake is only one of my favorite breakfasts of all time! I’m all over this! Gorgeous award! I’m so sorry about the spider — you’ve got to go for a checkup. A lot of spiders can be venomous. I don’t want to alarm you, but just take precaution. Hope you’ll feel a lot better soon, my friend. Yikes, I hope that spider bite has healed by now… as for this cake, arrrgghhh it’s pretty much everything I’ve been craving lately. I’d never thought to put lemon and coffee cake together, but it looks amazing. Lemon + mascarpone = perfect antidote for spider bite! I’m loving this cake! Pinning this now and can’t wait to try – thanks for sharing!